What a surprise when Ms. Goofy told me she picked up some special bacon from our local store. 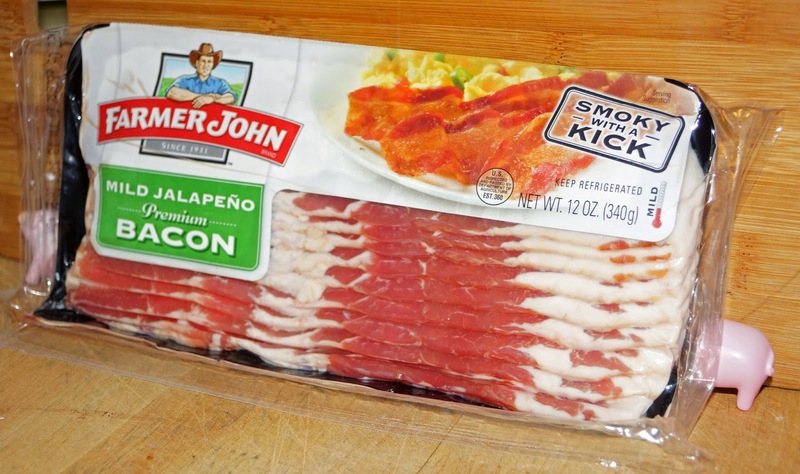 Jalapeno bacon has gone mainstream. Combine two of my favorite ingredients to create possibly a marriage made in heaven. The constantly burning light-bulb above my head was shining bright with this new product. We immediately broke out the black iron for a lashing of fire. When we opened this package a wonderful jalapeno aroma filled the room. The bacon crisped up very nicely. It had a good meat to fat ration. It was crisp, salty and (drum roll please) had a distinct, pleasant, mild, jalapeno flavor. This is when I started to dance, cry and celebrate the wonderfulness of life. Our first meal was of a juicy bacon burger. This special hamburger was sourced from our butcher friend Angelo. 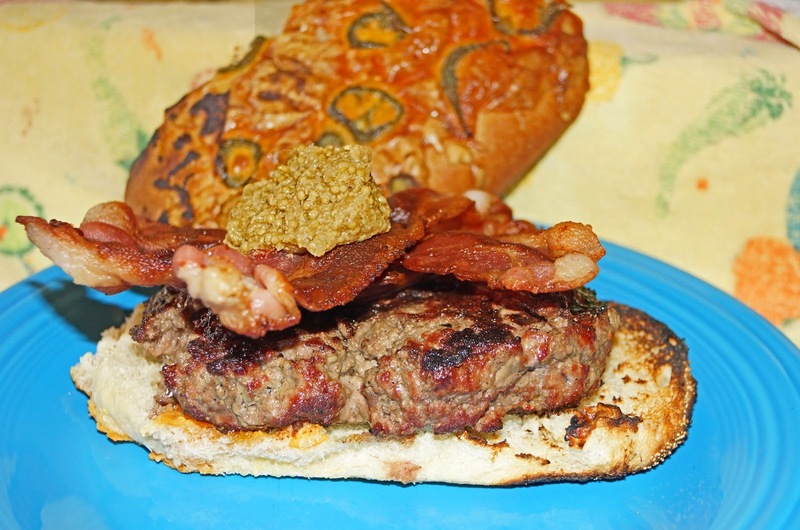 A dollop of home made mustard and all was assembled on a jalapeno cheese roll made to create a fantastic burger. We then made some candied bacon. 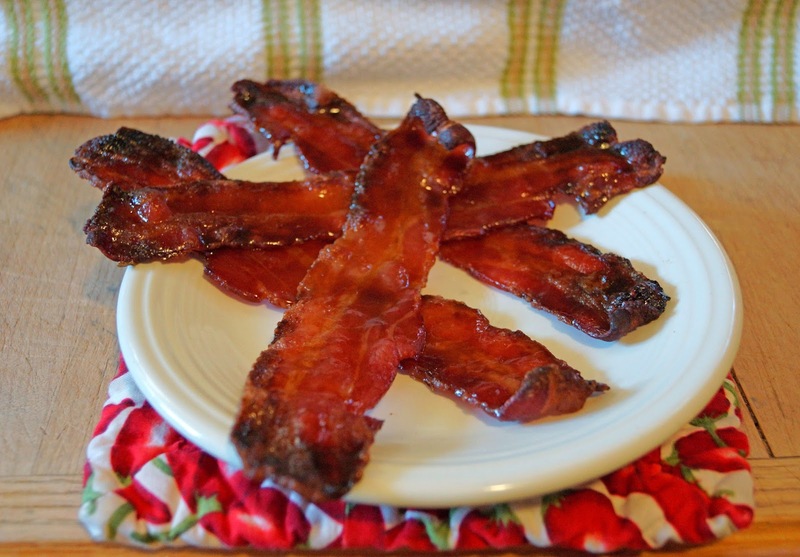 This is a simple process of baking the bacon with a sprinkling of brown sugar. 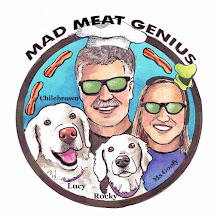 Bacon candy with a mild jalapeno twist rocked our world. Jalapeno bacon is here and we are happy. I can't imagine anything more perfect for you. Zoomie, I can. It is big. It is green and it may or may not be shaped like an egg. Oh, right! What was I thinking?? We never get nice bacon flavors like that around here. I am jealous. Three Dogs BBQ, The Farmer John brand owned by Hormel started in Southern Ca. I guess this brand is only sold in several west coast states. I was very surprised to see it at our local store. How do they get the Jalapeno in there? Trying to wrap me head around the concept. Greg, I do not know how Farmer John does it specifically. When you are curing bacon you can add flavors. I usually use brown sugar or maple sugar. You can also add chili flavoring then. It could be in the form of an extract,putee or dry rub. 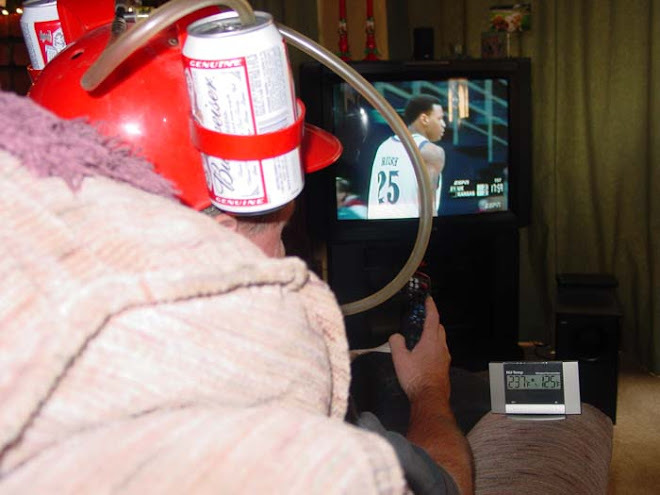 I may have to try that.